When ordering just one remarque, indicate your choice of "Snipe" or "Cross" in the comments box during checkout. On October 27, 1918 Maj. William Barker, one of the highest scoring Allied aces of WWI, took off from Beugnatre on what would become one of the controversial flights of the war. Flying a new type of aircraft, the Sopwith Snipe, Barker crossed over the lines in an attempt to score another victory before returning to England. 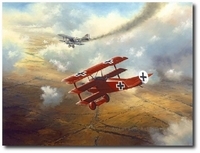 He found what he was looking for near the town of Valenciennes, scoring a high altitude victory over a two seat reconnaissance aircraft high above the Mormal Forest. 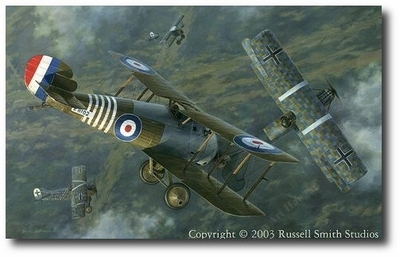 In the process, however, Barker himself was attacked from below by Fokker DVIIs from an unknown German Jasta. Wounded and disoriented, Barker lapsed in and out of consciousness as his plane fell from the sky. As he fought for his life among an unknown number of German aircraft he even attempted to ram one of the Germans. In the end, Barker managed to bring his Snipe down inside of the Allied lines. William Barker was awarded the Victoria Cross for his actions that day.